In the heart of the Lower Peninsula is an area known as the Shiawassee Flats where three great rivers; the Tittabawassee, the Shiawassee and the Cass, merge to form the Saginaw River. The result of all this water is one of the largest and most productive wetland ecosystems in Michigan and preserving a large portion of the Flats is the Shiawassee National Wildlife Refuge. Established in 1953 by the U.S. 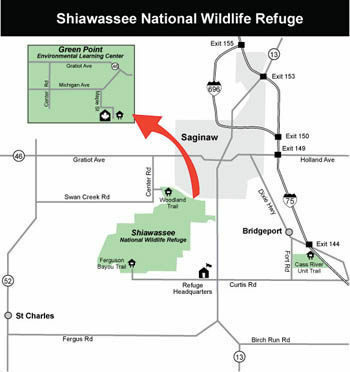 Fish and Wildlife Service, Shiawassee spans 9,501 acres just south of Saginaw with 75 percent of it being marshes, wetlands and bottomland-hardwood forests. The remaining portions are cropland, managed pools and moist soils units. Tying together the various sections is a system of dikes that protect critical habitat for migrating waterfowl and provide two-track avenues for hikers, mountain bikers, birders, even visitors looking for wildlife from the front seat of their cars. Wildlife, particularly birds, is the prime attraction at Shiawassee. Thanks to its location along the Mississippi Flyway, the federal refuge hosts more than 270 species of birds each year including raptors, shore and wading birds, and a 100 different species of songbirds. 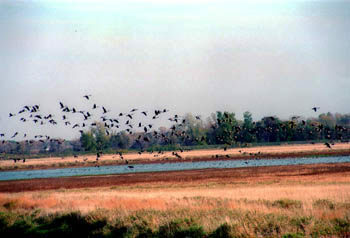 During the spring and fall migration thousands of ducks, geese and other waterfowl pause to refuel, reaching peak numbers in late October when up to 20,000 Canada geese and 30,000 ducks are present on the refuge. The best way to see waterfowl and other wildlife is via the refuge’s trail system on foot or with a mountain bike where permitted. Shiawassee has four trail systems that total more than 14 miles. 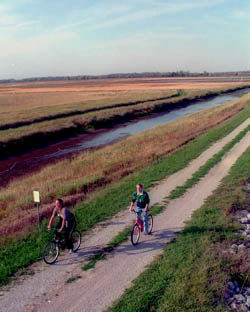 In the main portion of the refuge, the Ferguson Bayou Trail is a 5-mile route along dikes that includes an observation tower with a spotting scope and several photographer's blinds. The Woodland Trail is a 5-mile network in a bottomland hardwood forested area at the confluence of the Tittabawassee and Shiawassee Rivers. The system is a series of foot paths, not dikes, making it popular with cross-country skiers in the winter and mountain bikers for much of the rest of the year. Green Point Environmental Learning Center is Shiawassee's visitor center and serves as the trailhead to 2.5 miles of foot paths that lead to a fishing dock on the Tittabawassee River. And finally the Cass River Unit Trail is a mile loop located in Bridgeport Township just off of I-75 that features a short stretch along the Cass River. The other way to explore the refuge is in your car. 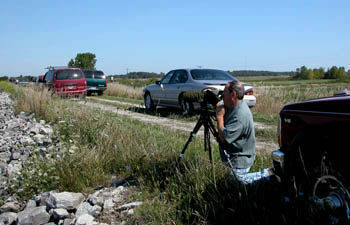 Slated to open in the spring of 2011, the Shiawassee Auto Tour is a 7.5-mile loop through the main portion of the refuge. Along the way there are two observation towers, interpretive displays and special parking areas that allow visitors to pull over and search for wildlife.